George Mitchell, special envoy to the Middle East. President Obama succeeded in keeping his balance on a diplomatic tightrope when he squeezed the Israeli-Arab drama into his first two days of business. He did as little as possible, which was wise. On his first day, he phoned the four main players -- the leaders of Israel, the Palestinian Authority, Egypt and Jordan -- to guarantee his ongoing interest in the issue. He swore to maintain Israel’s security while seeking reconstruction of Gaza. 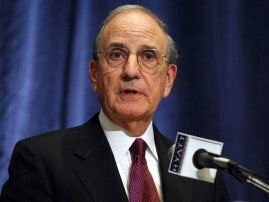 For the second day, his new Secretary of State, Hillary Clinton, appointed George Mitchell, a former Democratic senator from Maine, as special envoy to the Middle East. These steps were evidence that, whenever Obama tackles the Israeli-Arab conflict, he will no doubt face a range of internal and external challenges over the issue. He must confront a web of relationships on how best to deal with the situation in Israel, which could yet lead to a productive outcome. Everyone will have their role, which includes the Obama administration, the pro-Israel right, the pro-Israel left, Arab and Muslim Americans, the Israeli government, Palestinian leaders and, hopefully, the sensible but subdued pro-Israel center. All these parties must work together to improve conditions for both Israelis and Arabs, and simultaneously they should certainly raise legitimate concerns as they arise. Especially, hawkish pro-Israel groups need to be vigilant. After eight years of serving as cheerleaders for President Bush, who in turn served as cheerleader for some of ex-prime minister Ariel Sharon’s policies, the American Israel Public Affairs Committee and friends have genuine reason to question the incoming administration’s approach. Many Jews worried that Obama might favor the Arabs, considering the prominent anti-Israel hostility found in some quarters of the African-American community. It looks likely that Obama will take an evenhanded approach toward Israel. Staunch advocates for Israel such as Vice President Joe Biden, Chief of Staff Rahm Emanuel and Secretary of State Hillary Clinton are among Obama’s choices for the top levels of his administration. Sounds perfectly reasonable, especially coming from the usually more hawkish-sounding Klein, a Merion resident. Klein and Ben-Ami offer sentiments which suggest they are on the same page. The worry is what they are not saying. They need to place their concerns on the table, in a civil manner, and let Obama and Congress judge them on their merits. Obama must treat all parties with fairness and be willing to criticize factions when warranted -- privately first, then publicly if that does not work. Past presidents have been accused of pressuring Israel for unreasonable concessions or supporting Israel’s actions whether Israel is right or wrong. Many critics feel Bill Clinton should not have sought Arab control of East Jerusalem while others criticized Bush for failing to veto United Nations resolutions condemning Israel's actions in Jenin and Gaza, and imposing financial penalties for the construction of Israel's security fence. Other presidents succeeded in clashes with Israeli leaders. When President Reagan fumed over Israeli bombing of Beirut, he phoned then-prime minister Menachem Begin and threatened to reconsider America’s relationship with Israel if the bombing continued. The bombing stopped shortly. Israeli leaders must establish a stable government and proceed in a sensible direction. Their challenge is to ensure Israel’s security and avoid abuses against the Arabs. Departing Prime Minister Ehud Olmert failed to meet his first crisis, the two-front 2006 war in Gaza and southern Lebanon. To his credit, he directed the recent war in Gaza more skillfully. Arab leaders cannot expect to get all they demand. It is bad enough that two principal factions control separate land masses, but Fatah under Palestinian Authority President Mahmoud Abbas cannot take an all-or-nothing approach to negotiations if they expect to reach a fair settlement. They will need to make a very convincing case for control of East Jerusalem. I cannot understand why Israel should give that up. The road ahead for Israel’s future will be bumpy, but it does not need to be impassable. These tribes of rivals, so to speak, can work things out if they have the will.